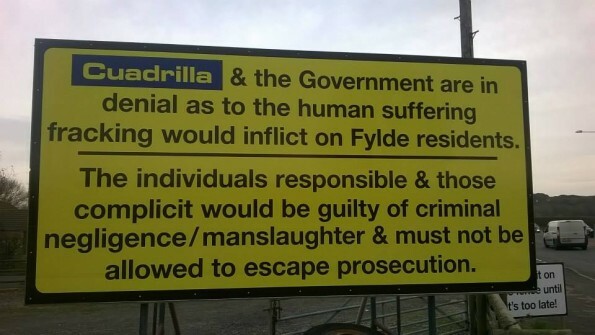 The information for the Public Inquiry for Cuadrilla’s appeal hearing has been released. This is where local democracy is truly tested in full public view and will set a precedent for all fracking applications in the UK. Appeals have been lumped together and will all be heard as one: both Preston New Road and Roseacre’s monitoring works and exploratory works will be included in one long hearing lasting up to 20 days +, if longer is required. The inspector will then make her report after the conclusion of evidence, and then forward to Greg Clark in Westminster for him solely to make his decision, after being present at none of the evidence hearings. Seems sensible. The Inquiry will open at 10.00hrs on Tuesday 9th February 2016 at Blackpool Football Club Conference Centre, Bloomfield Road, Seasiders Way, Blackpool, FY1 6JJ. The Inquiry is set down for 20 days, over period of 5 weeks, normally between the hours of 09.30 and 17.30hrs. It will not sit on Mondays, Saturdays and Sundays. Depending on the numbers wishing to speak, it may be necessary to limit the time allocated to each speaker at these sessions. In those circumstances it is anticipated that the Interested Persons will be given no longer than 5 minutes each to speak. If you are proposing to make oral representations by way of reading from a short written statement at one of these sessions, then a copy of that prepared statement should be submitted to the Programme Officer in support of what you wish to say, to the above email address. If all those who wish to speak cannot be accommodated within the dates and times set out above, then another opportunity will be provided within the Inquiry Programme before the Inquiry closes. Details of any such additional sessions will be announced at the Inquiry and published on the website at a later date.